NORTH ROBINSON — Colonel Crawford jumped out to a 20-0 first-quarter lead over Ridgedale on Friday and never looked back, celebrating a convincing 61-8 homecoming night victory. With the win, the Eagles improved to 5-2 overall and 4-2 in league play. Ridgedale is winless. Look for more photos from the game and Friday’s Homecoming festivities in our online gallery. The Eagles scored 27 more points in the second quarter and led 47-0 at the intermission. With a continuous clock running in the second half, the Eagles rolled to their 53-point victory. Blake Treisch continued his torrid offensive pace of recent weeks for the Eagles. He scored three rushing touchdowns while picking up 102 yards on just 10 carries. The Eagles shared the scoring load, with Trevor Shawber, Hayden Bute, Owen Kocher and Colton Rowland running for scores. Bute threw two touchdown passes, completing 3 of 8 passes for 68 yards. The Eagles racked up 308 rushing yards. Shawber chipped in 113 yards on just six carries. 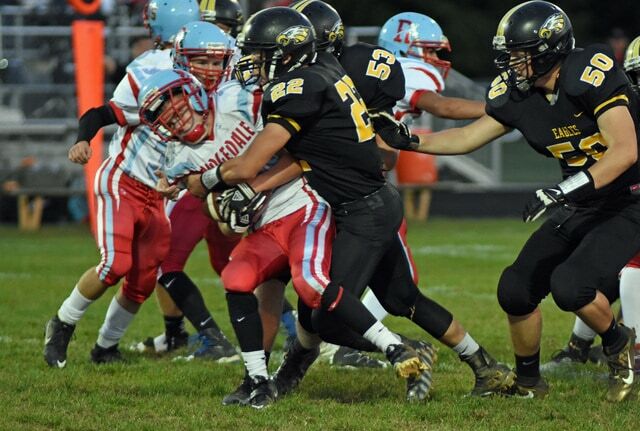 Ridgedale was held to just 59 yards of offense, 60 via the pass, and -1 on the ground. http://aimmedianetwork.com/wp-content/uploads/sites/38/2016/10/web1_inquirer-100716j-CCHS_Ridgedale-FB_0029.jpgColonel Crawford running back Trevor Shawber carries for a big gain against Ridgedale at the Eagles’ homecoming game Friday night at Gary Field. Photo by Don Tudor. http://aimmedianetwork.com/wp-content/uploads/sites/38/2016/10/web1_inquirer-100716j-CCHS_Ridgedale-FB_0034.jpgColonel Crawford linebacker Blake Treisch puts a bonecrushing hit on a Ridgedale ballcarrier Friday night during the Eagles’ homecoming game at Gary Field. Photo by Don Tudor.